Terrace Point 12A is a cliff top condo with stunning Lake Superior views. Terrace Point is a beautiful series of Lake Superior townhomes. The Terrace Point condos are located on a cliff`s edge on the shores of Lake Superior. See the Grand Marais Harbor in the background on the private Terrace Point shoreline area. The Frank Lloyd Wright inspired living room includes built in furniture and other details designed specifically for the space. Watch TV or watch the waves roll in from your living room. Enjoy your meals at the dining table or on the deck table. The bedroom is divided from the living room by a wood divider. Keep it open to enjoy the views or close it for privacy. The living room features a flat screen TV and gas fireplace. With a unique hidden TV you can raise it to watch or lower it to take advantage of the openess of this unit. The living room flows easily into the modern kitchen. The kitchen has stainless steel appliances, including a dishwasher. Enjoy preparing your meals in the modern, well appointed kitchen. The bedroom with the dividing window closed... ....and open. Choose your privacy. The bedroom features a king bed and great Lake Superior views when the divider is open and TV hidden away. The built in desk is a great place to work - if you must - during your trip. The closet has plush robes and room for your luggage. The bedroom flows into the bathroom and kitchen area. The bathroom features a walk-in shower and large vanity. Also enjoy the deep soaker jetted tub in the bathroom. Sit on the private balcony during your stay and enjoy the Lake Superior views. Plenty of room to enjoy your morning coffee or even a meal. The side balcony area. Terrace Point is a series of Frank Lloyd Wright inspired condos on a point overlooking Lake Superior.Terrace Point is a series of Frank Lloyd Wright inspired condos on a point overlooking Lake Superior. Enjoy fantastic views of Lake Superior from the cliff`s edge building. The mature grounds feature lots of trees, bushes, and wildflowers in the summer months. With no visible neighbors in front or to the sides of Terrace Point you have plenty of privacy. Enjoy Lake Superior views from your private balcony. Enjoy the wildflowers in the summer months. Lots of mature trees dot the property. There are two shoreline access points on either side of the building. This photo was taken near the east side shoreline access area. Terrace Point units share two ledge rock shoreline- one to the east and one to the west of the buildings. Use caution when going down the makeshift stone steps. Enjoy wonderful Lake Superior views from the private ledge rock shoreline at Terrace Point. Enjoy a romantic getaway in this unique condo inspired by the architectural style of Frank Lloyd Wright. From your deck you will enjoy sweeping views of Lake Superior while listening to the sound of the waves hitting the shoreline. The point of Grand Marais is visible in the distance with the town just a short four-mile drive away. This condo is furnished in the typical style of a Frank Lloyd Wright inspired home, with each piece of furnishing carefully designed for the space. The well-stocked kitchen offers modern stainless steel appliances. Enjoy lake views from the living room, bedroom, and your private balcony, or sit back in the living room and enjoy the beautiful stone surround fireplace. The unique layout with a decorative wooden divider separating the bedroom and living room can allow for open concept living when open, or privacy when closed. Hidden away in the space between the living room and bedroom you will find the flat screen TV that swivels to allow for viewing in either the living room or bedroom. Many treasures abound in this unique condo. Whether your trip to the North Shore is for adventure or to relax, you will find plenty to do just a few miles away. Head up the shore to Grand Marais where you will find a variety of shops and restaurants. Casually stroll along the harbor or take a hike out to Artist's Point and the Lighthouse. Or head down the shore to Cascade State Park for a short hike to a beautiful waterfall and then grab a bite to eat at the Cascade Restaurant. Lutsen Mountains is about a 15-minute drive away, so bring your skis and hit the slopes for a day (in the winter) or check out the Alpine Slide (in the summer)! Of course, you will find plenty to do just staying close to home. Grab a book and sit out on your private balcony or enjoy a movie night with the one you love. 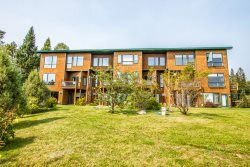 The condo was in a perfect location for us; close enough to Grand Marais to easily get to restaurants, while being beautifully located right on the lake with fabulous views. Questions I sent were answered immediately. Gorgeous property. Beautifully designed and minimalist decorating. One of the chairs was so comfortable that I considered buying one. The chair is too pricey for me. I am impressed that it was in a rental property. The location is fantastic--a short drive to Grand Marais and to state parks. The one thing I missed is good walking trails on the property. That would not prevent me from staying again. The view is exactly what I hoped for. The sound of the waves was all we heard. It exceeded our expectations. The pot and pans, silverware, etc, classy.